'SEAL Team Six' And Other Elite Squads Expanding The team that killed Osama bin Laden is part of an elite group of U.S. Special Forces that plays a growing role in military operations worldwide. Navy SEALs, Delta Force and other units are considered by many to be the best of the best. And the Obama administration has been building up their ranks. The team that killed Osama bin Laden is part of an elite group of U.S. Special Forces that plays a growing role in military operations worldwide. Navy SEALs, Delta Force and other units are considered by many to be the best of the best. And the Obama administration has been building up their ranks. The operation that sent members of SEAL Team Six to attack Osama bin Laden's compound last week may be the best-known mission ever conducted by this elite unit, but it and other Special Operations forces have become increasingly important to the conduct of America's wars over the past several years. While conventional units from the Army and Marines focus on protection of the population in Afghanistan, for example, on what's called counterinsurgency, Special Forces organized into what's known as hunter-killer units concentrate on counterterrorism. They swoop in, usually at night, to target high and mid-level Taliban commanders. If you have questions about the composition and use of U.S. Special Forces, give us a call. We'd especially like to hear from current or former members of the Special Forces. What do we need to understand about your jobs? Give us a call, 800-989-8255. Email talk@npr.org. You can also join the conversation on our website. Go to npr.org. Click on TALK OF THE NATION. Later in the program, the Opinion Page. Do we need to be asking more questions about the ethics and legality of the bin Laden mission? But first, we're going to be talking about SEAL Team Six and other United States Special Forces units, and joining us here in Studio 3A is Julian Barnes, a reporter for the Wall Street Journal who covers military and national security. And thanks very much for coming in today. Mr. JULIAN BARNES (Wall Street Journal): Thanks for having me. CONAN: And this has been a steady move of emphasis as, particularly in Afghanistan, we see Special Forces taking more and more of the burden. Mr. BARNES: That's absolutely right. I think especially since 2009, when the Obama administration began, you saw more of a shift of units, Special Operations Forces. The Obama administration pulled them out of Iraq and moved them into Afghanistan. And we've seen almost a quintupling of the number of the most elite of these units. CONAN: And the most elite of these units, well, we've all heard about SEAL Team Six, and I guess everybody's probably heard of Delta Force too(ph). Mr. BARNES: That's right, and this is what the U.S. government calls the special mission units when they acknowledge them. They're all part of Joint Special Operations Command, or JSOC, which also has Army Rangers in it, although those aren't always part of the JSOC. CONAN: And often transported and supported by a special tactical unit from the United States Air Force. Mr. BARNES: That's absolutely right. CONAN: And those fly, well, all kinds of interesting aircraft, as we saw in -we learned a lot about tradecraft in this most recent mission. Mr. BARNES: We did. I mean, the U.S. keeps a lot of the tactics, techniques and procedures of these special mission units very secret. And a raid like the SEAL Team Six raid on the bin Laden compound opens that up, and we get to see a little bit about how they do what they do. For example, they use modified Blackhawk helicopters that appear to have some sort of stealth technology, something we didn't know about. And appeared to have - used a dog on the raid. Mr. BARNES: That's right. One can imagine that since dogs are regularly used in Afghanistan by conventional troops, that the elite units would use them as well. But we didn't know that, and so now there's some sort of superdog out there. CONAN: And the composition of that force, 79 men we're told, went out of those helicopters into the bin Laden compound. Do we know exactly who? Mr. BARNES: Well, there were 79 people on the mission. I - what we've heard at the Wall Street Journal is about 24 or 22 of those people were as part of the raiding party that landed on the ground and went into the compound. You know, that's a large number for a place like this. That's something in the past that they have kept under wraps, to exactly how many people would go on a mission like this. CONAN: So the others would have been air crew or perimeter protection, that sort of thing? Mr. BARNES: They could be air crew. They could be other people who helped prepare back at the Afghanistan base where this was launched from. CONAN: Okay. As we look at this operation, though, yes, this is one of a kind. Nevertheless, it is representative of more and more of these missions in Afghanistan. Mr. BARNES: Yeah, I mean Leon Panetta said over the weekend: This is something these guys do multiple times a night. And there's some truth to that. There's no mission like going after bin Laden, but you know, we've seen some 11,000 raids over the past year by various types of Special Operations Forces in Afghanistan, nighttime raids where a small team drops in, going after what the command in Afghanistan calls a jackpot, a mid-level of even senior-level Taliban leader. CONAN: And some question, some people question whether this is - you know, obviously it could be effective, it's important to do, but it's also whether it's targeted killing. Mr. BARNES: Yeah, very much of an issue here. These are hunter-killer teams. They go in and, you know, they operate when they're in Afghanistan under military - the law of war. So they would - you know, military commanders say if somebody surrenders, they will - they'll take this person in capture. If they're going to resist, they will be eliminated. CONAN: Well, joining us now is Howard Wasdin, author of a new book called "SEAL Team Six." He was formerly a member of this elite unit and served as a sniper, and he's got a new book called "SEAL Team Six: Memoirs of an Elite Navy SEAL Sniper." And Howard Wasdin joins us now from his office in Jessup, Georgia. Nice to have you with us today. Mr. HOWARD WASDIN (Author): Hey, good to be here, guys. Thank you. First of all, I'd like to say that this is just timing. All the credit goes to my former teammates, and this book was written two years ago and in no way should take away from what they did, and all the attention and praise should be given to them because I haven't been active since 1995. CONAN: Well, I wanted to give you, though, the chance to tell us a little bit more about this unit in general. Obviously, if you haven't been active in some years, specifics may be - well, you probably know more than we do. But in any case, were you surprised to find out SEAL Team Six was designated for this operation? Mr. WASDIN: No, it would have come down to one or two groups, in my mind, that would have done this type of op. I'm glad that it was my former unit, but yes, it doesn't surprise me that it was them. As far as telling you about the group, I'm not giving anything up by writing this book. It's not about, you know, anything secretive or giving up national secrets. 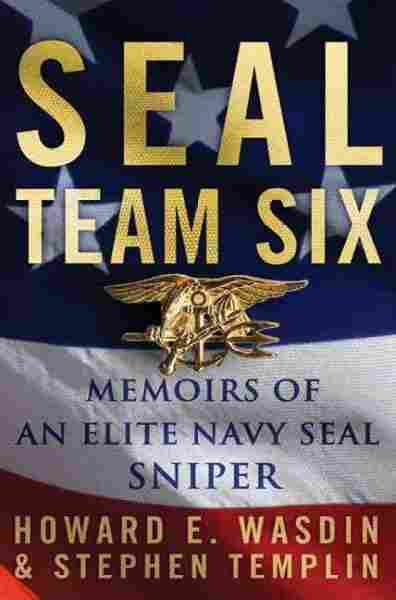 And the first book about SEAL Team Six was written in the late '80s or early '90s. So this book is in particularly about overcoming adversity when I was trying to fit back into society after being in the team. CONAN: And that is a great deal of the book, though a lot of the book is also about the specialized training that you had to go through first to join the Navy SEALS. That's basic training called BUD/S. Mr. WASDIN: Right. Basic Underwater Demolition SEAL School is what that is, and that's been very well-documented, even better so in other books than mine. But I talk about my personal ordeals going through BUD/S and the training involved there, and rigorous training. The training, which I might add, is designed to separate out just the physically elite from the physically and mentally elite, which mental toughness is the whole premise for SEALS being trained, mentally tough. CONAN: Then you joined SEAL Team Two. That's sort of a graduation school? Mr. WASDIN: No, SEAL Team Two, and there's no hierarchy in the teams, your team number is just where you're stationed. All SEALS in my mind are equally elite. It doesn't matter if you're SEAL Team Two, One, Six, 10, it doesn't matter. All SEALS are equally elite. What differentiates SEAL Team Six is the funding. I heard one - a couple of your guests when I was waiting to come on, and they seem - some people seem to think of this is, like you were saying, a hunter-killer team or whatever. And that may be true, but the thing is, everything is based on the judgmental use of deadly force. So these guys are trained not just to go out and kill, it sounds like it's indiscriminate, but to use that judgmental use of deadly force. CONAN: I don't think anybody said it was indiscriminate. It said it was targeted. Mr. WASDIN: Well, targeted is the word you can use, but it makes it sounds like there was no other option except to just go kill them. He determined whether he was killed or captured by his actions in that room. CONAN: Well, we'll have more about that later, and I appreciate your input on that. But the level of training - and correct us if we're wrong - but we understood that it was only after some time in other SEAL units that you were considered eligible to join SEAL Team Six. Mr. WASDIN: And that's true. You screen to go to SEAL Team Six. And like I said, any SEAL in any other unit, in my opinion, is equally special. SEAL Team Six just has better funding, better toys. You do screen to go there. In my case, this was back when there hadn't been a lot of combat in the world, and I was able to come out of Desert Storm and screen and get picked up the first time and go to SEAL Team Six right away. CONAN: And we have learned things from operations that did not go well. After the disaster at Desert One in 1980, in Iran, well, that led to the formation of Delta Force, as I understand it. What have we learned - you were involved in Somalia, in the disaster that came to be known as Blackhawk Down, by the name of that famous book. What do we think - what did we learn from that? Mr. WASDIN: Well, hopefully what we learned from Somalia in particular, which by the way was my career ender. That was the raid that I got shot three times and eventually ended up getting out of the teams. What I hope - hopefully we learned from that was two things. And listen, I'm a die-hard Republican, but I'm giving the president all the credit here. He did exactly what needed to be done by not alerting Pakistan. So our operational security was good. So the guys didn't have somebody waiting on them, you know, the bad guys waiting on them when they got there, or - just totally gone. So the op sec, the president did a great job there. In Somalia we had terrible op sec, of course, because the United Nations was involved. You didn't know which one of these guys you could trust and which one you couldn't, and as it turns out, the guy who brought one of the downed Blackhawk pilots back actually had U.N. credentials when he brought him on the runway. So don't trust anybody outside your own little group when you're doing an op like this. And the other thing I'd want to say while I'm bragging(ph) on the president - I can't believe I would have ever done that with this president, but he's kind of changed my mind the past week or so - is him not releasing the pictures. I think he's doing a great job by not doing that because - why? Don't give our enemies anything to fire them up. Mr. WASDIN: I've got about a minute and a half. CONAN: I understand that. Justin's on the line from Philadelphia. JUSTIN (Caller): Hi, thanks for taking my call. Just from my amateur standpoint, it seems that not just in terms of the youth of Special Ops groups but in terms of the character of the U.S. military as a whole, with the technologies that are coming out and the way that they're operating, there seems to be this paradigm shift away from big numbers of aircraft and guncraft and troops on the ground and stuff toward these surgical, targeted strikes by very elite personnel. CONAN: Justin, I'm going to stop you there because I wanted to give Howard Wasdin a chance to respond, and we'll talk more about that with Julian Barnes when we get back. But Harold Wasdin? Mr. WASDIN: Yes, and that was well thought out and well-asked. Actually, John F. Kennedy, as a matter of fact, is the one that saw that conflicts of the future will be, quote-unquote, low-intensity surgical-strike-type conflicts, which is why he formed the SEAL teams in the first place. So yes, definitely the world we live in, the type of covert warfare, the battles that we're fighting now, are - I think you'll see more of that, and I think these guys did a great job. I just want to say God bless all the American troops. I've got to run. CONAN: Justin, thanks very much for the call. And Howard Wasdin, thank you very much for your time. CONAN: And there he goes. He joined us on the line from his home in Jessup, Georgia. More with Julian Barnes of the Wall Street Journal when we come back after a short break. Stay with us. I'm Neal Conan. It's the TALK OF THE NATION from NPR News. CONAN: This is TALK OF THE NATION from NPR News. I'm Neal Conan. We're talking about Special Forces, groups of elite U.S. troops who operate largely in secret. In recent years they've been sent more and more often onto battlefields and terrorist hotspots, by the Wall Street Journal's count more than 11,000 raids in the past year, which captured or killed some 10,000 insurgents in Afghanistan. All of this is transforming the way military confronts its enemies. Our guest is Julian Barnes, who covers national security for the Wall Street Journal. If you have questions about the composition and use of U.S. Special Forces, give us a call. We'd especially like to hear from current or former members of the Special Forces, 800-989-8255. What do we need to understand about your jobs? Email us, talk@npr.org. You can also join the conversation on our website. That's at npr.org. Click on TALK OF THE NATION. Julian Barnes, I wanted to follow up with you on the question that was posed to Howard Wasdin just before we went to the break, and that's about the decision to replace conventional military units as we've gone from a world where the idea was massive numbers of Soviet tanks rolling across the north German plain to, well, fighting small-unit actions in Afghanistan. Mr. BARNES: I think if we look at the sort of military thinking over the last decade or two decades, you can see these small elite units come in and out of fashion. Of course, Rumsfeld came in at the beginning of the Bush administration arguing that the era of big militaries was over and putting the emphasis on Special Operations Forces. But the war in Iraq showed that you really do need a large military. We're coming back now, after a very large buildup in Afghanistan, where there are increasingly some skeptics in the Obama administration about the cost in lives and money of keeping large numbers of troops in Afghanistan. And hence the appeal of building up these small elite units. CONAN: Let's go next to Bob, Bob with us from Jacksonville. BOB (Caller): Hey, how are you doing today? BOB: I was in Naval Special Warfare from 1975 to 1984. I was wounded in a combat situation and I got out. Back then I was in part of Operation Blue Shield, which was a failed operation during the Carter administration with the hostages. BOB: I don't know if you remember that. CONAN: I think we do, yeah. BOB: (Unintelligible). But anyway, when we came back off that operation, we were, you know, still pretty hyped, and we were sent out to do another operation. And we trained, you know, so hard for this one particular operation, and we were told that we were going to go overseas and we were going to be blowing up a dam. So we trained and trained and trained, and when we got there, as it turned out we were downriver and we had to blow up beaver dams to keep the water flowing so that we could support our operation. CONAN: You had to blow up beaver dams? BOB: Yeah, because the beavers were closing off the waterway. And so that's what we ended up doing, blowing up our dams, was - were beaver dams. BOB: The point is we really never even - you know, a lot of times you don't even know, you know, what you're getting into or what, you know, or what the situation's going to be until you get there. CONAN: I guess sometimes it's important to have a hydrologist on the intelligence team. Well, thanks very much for the call, appreciate it. Mr. BARNES: That goes to a real change in the culture of Special Operations Forces. We had, in previous generations, you could have people who just trained and trained and trained, and they might do one operation or even no operations throughout a career. Now we have nearly constant deployment for these guys over the course of the Afghanistan war, where, you know, night after night they're doing operations, really quite, quite intense. CONAN: Yet we saw in this particular operation that dummy - a dummy of the specific compound was constructed, practices were held on it. There was a model of it in the White House Situation Room. That's a little unusual. Mr. BARNES: Yeah, I mean, what we think has happened, although details are a little sketchy, that when the CIA contacted JSOC, the Special Operations Command, about doing this mission, they looked to see what unit was not deployed. They found a squadron from SEAL Team Six and assigned them this mission. So they were able to spend weeks and indeed months training for the raid on the compound. CONAN: Let's go next to Jake(ph), and Jake's with us from Charlotte. JAKE (Caller): Yes, yes. I just wanted to say hats off to the group. My father was ex-military and participated in several of these units as I was a child growing up. The - one thing I'd like to say is it's not just one mission that these guys participate in. It's a lifestyle. It's what they do. They train. They're always away from the house. They're on missions. And it's real patriotic to hear what these guys did. They're living legends, and hats off to them. So thank you very much. CONAN: I just wanted to ask, this is obviously, it's - we're told that these elite units, the Delta Force and SEAL Team Six, are somewhat older than we might expect, not the young men who are in conventional forces for the most part. But isn't there a time, don't they have to leave these units fairly young? JAKE: Oh, well, I was young as a child and my father was always gone. So I guess the point I wanted to make is that, you know, these guys that went out and did the bin Laden thing, you know, they're getting the credit for doing the one mission, but there are missions all the time that go unnoticed and not heard or observed or given no credit. But, you know, it's something that they do on a daily basis, all the time. And it does, it's stress, it's stress for their own lives and personal lives. So that was the only point I wanted to make. CONAN: All right, Jake, thanks very much for the call, appreciate it. CONAN: And he does make the point that, yes, we hear about this operation, myriad operations in Afghanistan that are never reported on or only fleetingly, perhaps. And yet there could also be operations, plenty of them, where they went out, trained for weeks or maybe even months and never went out at all. Mr. BARNES: That's right. And I think you hear a lot from people about the sort of big operations that they train for that they don't ultimately get a nod, the president doesn't allow them to go into the country. You know, but I think if we, you know, just look at the pace of operations nowadays, you know, if a big planned operation doesn't go off, the next night there's something more. And we've - you know, much of these operations, the details don't ever come out. It's unlike the other missions by conventional forces. Usually they don't release a press release about the JSOC missions in Afghanistan or elsewhere. CONAN: Here's an email from Ron(ph) in Washington, says: Aviation support is supplied by the Army 160th SOAR, Special Operations Aviation Regiment. Air Force Air Commandos offer different assets. Team Six fires more ammunition per week than any other SOF unit, Special Operations Forces, and Delta is better suited to clandestine operations requiring stealth and undercover work. Is that right, so far as you know? CONAN: The Army flies helicopters as a rule, and the Air Force flies fixed wing. CONAN: That's been a strong division for quite some time. Mr. BARNES: There is. And it's a little murkier now, especially with search and rescue, but that is generally correct. CONAN: Let's see if we can go next to - this is Jim, Jim with us from Virginia Beach. JIM (Caller): Thanks for taking the call. JIM: The SEAL - this isn't new to the SEAL team. The SEAL team has a giant building at their complex in Dam Neck, and it's a mega concrete building. And inside of it are movable steel panels that can - so this building inside can be set up in any kind of scenario, a hotel scenario, a shopping center scenario, whatever they want to do with it. It's a live fire. Also, on the roof, there's all kind of different hatches that would represent ship hatches and all the different type of entries. And so the SEAL team can practice not only for this one mission, the made-up compound that they had, but they practice these things all the time in real scenarios. CONAN: Dam Neck, just outside of Norfolk, Virginia. JIM: Dam Neck is in Virginia. It's in Virginia Beach, on the oceanfront. CONAN: And that's where you're calling from. Have you been inside this particular building? JIM: I have been inside that building, yes. CONAN: And what was it set up as when you saw it? JIM: I can't really tell you that, Neal. But I appreciate the - but it was set up as a multi-room facility. How about that? The important thing about this thing is that the SEALS have the access to this thing. They can be - these panels can be moved around in any configuration. So they can practice on all these scenarios in real time with live ammunition. And when you get out in the field, that's definitely important. CONAN: All right, Jim, thanks for the call. We appreciate your discretion as well. CONAN: Appreciate that. We're talking with Julian Barnes, a Journal reporter, Wall Street Journal reporter, who covers the military and national security. And he's with us here in Studio 3A. We're talking about the increasing use of Special Forces units. And as this continues, and we saw, as you mentioned, Donald Rumsfeld and the previous administration argued strenuously that the kind of success that was brought about initially in Afghanistan, that brought about the downfall of the Taliban government that was, well, working in collaboration with people who were there, the Northern Alliance. It was working with the Central Intelligence Agency and a lot of use of Special Forces. Mr. BARNES: That's right. The initial part of the Afghanistan war was almost purely Special Forces, Special Operations Forces and some CIA paramilitary teams that are similar. And I think in Afghanistan, we're going to be eventually moving toward that again. The end of the Afghanistan war for the U.S. is going to look a lot like the beginning, where U.S. power is exercised through these small teams. But the view in the military is you need a larger footprint there, right now, in order to stabilize it. CONAN: To stabilize the population and resist the Taliban. This is, as we listen to this argument that's going to be developing over the next few weeks and the decision we're expecting in July, as to what the size of the initial drawdown will be. As you hear people talking about counterinsurgency; those who are saying we need large numbers of forces, probably about as many as we have now, to occupy a lot of areas to give the Afghan army more time to train, the police more time to get up and up to speed; while those who talk about counterterrorism say we can afford to do more of these targeted operations, operate against al-Qaida, in particular, in that fashion, and maintain forces of, well, commandos, like SEAL Team Six, and air assets that can bring down, if you can get forward air controllers in, can bring down targeted air strikes. Mr. BARNES: That's right. Counterinsurgency is about protecting a population. These small elite commando units, they can't protect a town from intimidation by a group of Taliban. They can disrupt the Taliban. They can swoop up and kill a leader, and that can cause problems with command and control, but they're not able to protect a swath of the country. That requires larger amounts of troops. CONAN: Some might say it's the difference between a raid and a campaign. Yet in Afghanistan, we've seen a campaign of raids, as you've described it, where time after time, night after night, sometimes several times a night, these teams go out and target midlevel and senior Taliban commanders. Mr. BARNES: And what senior military officials will tell you is, right now in Afghanistan, these two strategies are very much interlinked. You can't separate the counterterrorism from the counterinsurgency. They're both aiding each other. CONAN: We're talking again with Julian Barnes of The Wall Street Journal. You're listening to TALK OF THE NATION from NPR News. Let's go next to Ken, and Ken is with us Oshkosh. CONAN: Hi. You're on the air, Ken. Go ahead, please. KEN: Yeah. In 2004, I suggested, on a website, that we do two things. Mainly, one; train 10 percent of all standard forces, cross-train them as you would A-teams. And secondly; reinstitute the use of dogs with these units, because you have the ability for that animal to actually know all the members of the units, just like an electronic grid that allows you security. And we would be able to give operational capability to, even, standard units. CONAN: ...units like the Rangers, which are pretty big units? Mr. BARNES: Yeah. The Rangers, as you said, are bigger units. Still, it's a small slice. These units are pretty small. SEAL Team Six, probably around 300 people, although we don't know. And the larger special operations community, they keep those numbers closely held. But compared to the thousands of Army soldiers and Marines, it's a small number. But the caller makes a good point that, you know, a lot of the equipment, a lot of the tactics, a lot of the know-how of the Special Forces has filtered down to the conventional forces. The conventional Army and Marines are battle hardened after 10 years of fighting. CONAN: Here's an email we have from Eric in North Carolina, which may or may not be near Fort Bragg. For clarification, there's a distinct difference between Special Forces and Special Operations Forces. Special Operations Forces, SOF, is an umbrella term that comprises all the units that fall under U.S. Special Operations Command and JSOC. SOF includes Army Rangers, Special Forces, 160th SOAR, Navy SEAL teams, Air Force Combat Controllers and the JSOC Special Mission Units, those are - we're talking about Delta and SEAL Team Six. Each unit has a distinctly different mission and specializes in conducting operations in different environments. Special Forces are only part of the U.S. Army or commonly known as the Green Berets. They specialize in unconventional warfare. So that - thank you, Eric, for that. And let's see - we go to - this is Warren. Warren with us from Grand Rapids. CONAN: Khalid Sheikh Mohammed, yes. WARREN: Yeah. And whatever. And we didn't get any information good from that, but later due to other techniques, we got something that led to some information that was useful. But the point is, as any private knows, that's in Afghanistan or Iraq, that you - when you're breaking into places you want to find information, and the most important information is people. And so you try to capture the people and interrogate them and so on. And they didn't do that. With, apparently, we get these floating stories that keep shifting. There was a horrible firefight, and there was no firefight. And he had a gun, and he did had a gun nearby. And the place, they shot a woman, killed a woman, wounded a woman, shot him twice in the head. He wasn't armed. He has a - the head of the information things. We're torturing his number two guys. We can't get the number one guy to come along. I mean, it just seems like they wanted to do what they did to pineapple face down in Panama who threatened to show and blow the lid off everything. And now, nobody is allowed to talk to him, and he - I think Obama - Osama knew too much. CONAN: I think you're talking about President Noriega of Panama, but in any case, we're going to be talking about more about this in a moment on another level. But, yeah, that's - you would think that the primary mission would have been to capture and use Mr. bin Laden as an intelligence asset. Mr. BARNES: Well, unfortunately, capturing people right now is very fraught for the U.S. There's not a really good solution of where to put them. The Obama administration has generally not captured people. They've instead let allied countries capture them. Hence, this may have been the plan for the survivors of the raid to be picked up by the Pakistanis and try to get access through the Pakistanis. You know, other than Bagram, the detention facility at Parwan, there's not a place where the U.S. really wants to put people. The Obama administration does not want to put more prisoners in Guantanamo. CONAN: And so far as we know, has not. Julian Barnes, thank you very much for your time today. CONAN: Wall Street Journal reporter Julian Barnes joined us here in Studio 3-A. More on this on The Opinion Page in just a minute. Glenn Greenwald will argue that we need to ask more questions about the ethics and legality of the bin Laden mission. Stay with us. I'm Neal Conan. It's the TALK OF THE NATION from NPR News.